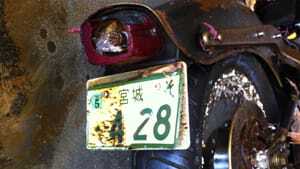 ...The motorcycle's licence plate shows it was registered in Miyagi Prefecture, and writing on the container matches photos of a commonly used Japanese moving van. according to a comment in the article (CBC), the owner has been found. ...also, CNN recently aired a report about the debris heading for the west coast of north america. The reporter claims that there is little to no danger from the radioactive Cesium 131, which has a short half-life. "Iodine 131, Cesium 131. Whatever it is." Is it not astonishing how badly they have misrepresented the facts?